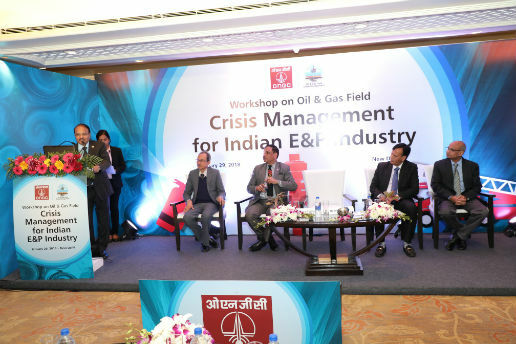 New Delhi: ONGC organized the first Oil and Gas Field Crisis Management Workshop for Indian E&P industry at Delhi. The aim of the workshop was to provide a common platform for quick response & mitigation of Oil & Gas field crisis in Indian E&P industry and to showcase the capabilities of ONGC to deal with oil field crisis situations. ONGC is the only Indian E&P Company having its own Crisis Management Team (CMT) and specialized equipment required for Oil & Gas well blowout control. Addressing the workshop, Mr Shashi Shanker, CMD, ONGC said that ONGC accords the highest importance to safety standards and has groomed its Crisis Management Team into a ‘best-in-class’ unit to tackle any kind of Oil & Gas well blow out and well control incidents. “Collaboration of Indian upstream companies will leverage each other’s strength in tackling crisis situations”, he added. Mr V P Mahawar, Director (Onshore), ONGC remarked that the E&P industry requires high level of investments and involves risk, uncertainties and surprises. “Every crisis event is unique and different control strategy has to be planned for faster response and early mitigation. 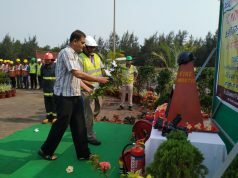 Well-coordinated planning and its safe execution, is the key to success in mitigating cost intensive oil well blow out control and firefighting operations”, he said, sharing his own experiences in mitigating various crisis situations. ONGC CMT has been at the forefront of Indian E&P industry during crisis to prevent loss of natural resources of the nation. It has a proven track record of successfully mitigating several well control/blowout incidents of ONGC & other Indian public/private sector companies like Oil India Ltd., GeoEnpro Petroleum Ltd., SELAN Exploration Technology Ltd. etc. Mr Shanker and Mr Mahawar chaired important sessions in the workshop, attended by the who’s who of India’s upstream sector companies such as Oil India, Vedanta – Cairn Oil & Gas, Reliance, GSPC, SELAN Exploration. Heads of Drilling Services and key executives from ONGC participated in the workshop.